Etobicoke Creek /ɛˈtoʊbɪkoʊ/ ( listen) is a river in the Greater Toronto Area of Ontario, Canada. 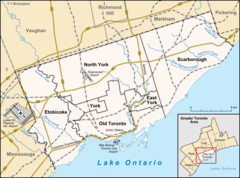 It is a tributary of Lake Ontario and runs from Caledon to southern Etobicoke, part of the City of Toronto. The creek is within the jurisdiction of the Toronto and Region Conservation Authority. The name "Etobicoke" was derived from the Mississauga word wah-do-be-kang (wadoopikaang), meaning "place where the alders grow", which was used to describe the area between Etobicoke Creek and the Humber River. The first provincial land surveyor, Augustus Jones, also spelled it as "ato-be-coake". A letter from January 22, 1775 uses "Tobacock". Etobicoke was adopted as the official name of the township (later city, now part of the city of Toronto) in 1795 on the direction of Lieutenant Governor John Graves Simcoe. The name for the waterway used in the Toronto Purchase treaty was Etobicoke River. Simcoe in a memo from April 5, 1796 refers to it as "Smith River or Etobicoke". In a letter dated April 9, 1796 he used "Tobicoke". Both "creek" and "river" appear in newspapers and books until about 1960.: 97: 99 "Creek" was officially adopted by the Geographical Names Board of Canada on November 18, 1962, though it existed far earlier. Etobicoke Creek begins south of the Oak Ridges Moraine and flows through Caledon, Brampton, and Mississauga — west of the Toronto Pearson International Airport and the surrounding industrial area — to its mouth at Lake Ontario in the Etobicoke portion of the city of Toronto. The length of the creek is 61 kilometres (38 mi). The creek's southern section forms a city and county-level boundary, separating Toronto on the east from Mississauga, part of the Regional Municipality of Peel, on the west. The eastern side is in Toronto. The watershed encompasses 211 square kilometres (81 sq mi). Mean summer waterflow has increased over the period 1967 to 2006 from 3.5 m3/s to 5.0 m3/s as recorded at a measuring station near the river mouth at the Queen Elizabeth Way. The creek ends in a large recreational area, Marie Curtis Park. It is surrounded by big cliffs and the bottom is solid stone, often covered with smaller rocks. It is full of little fish and crayfish, a sign of purity of water. The creek is characterized by winding paths ravines and shale banks. A section of Etobicoke Creek runs close to Toronto's Pearson International Airport, leaving a ravine very close to the west ends of runways 24L and 24R or the beginnings of Runways 6R & 6L. There have been two major aircraft incidents which have resulted in aircraft in the ravine. On 26 June 1978, an Air Canada Douglas DC-9-32, Flight 189, with 107 people on board, overshot runway 24R and crashed into the ravine, destroying the aircraft and killing two of the passengers. On August 2, 2005, an Air France Airbus A340-300, Flight 358, with 309 people on board, overran runway 24L into the ravine, followed by a fire on board. All people on board escaped safely but dozens were injured. One passenger, Roel Bramar, later commented, "It was a hell of a roller coaster going into the ravine." Although it was widely reported the Air France plane landed in a heavily wooded area, the area is in fact is fairly wide open, due to airport maintenance of both sides of the ravine. The west side of the ravine is a gentle slope, with grass and the airport's light towers for both 6R and 6L. The burnt-out fuselage of Air France Flight 358 after overrunning runway 24L at Toronto Pearson International Airport. The position of the ravine so close to the airport's overrun area has raised some concerns among the general public, despite Toronto Pearson's compliance with all safety regulations. Markland Wood is bounded by Etobicoke Creek to the west and Elmcrest/Renforth (tributary) Creek to the east. Long Branch is bounded on the west by Etobicoke Creek. Renforth Creek - small tributary that begins from two ponds inside Etobicoke Centennial Park and flows in Etobicoke Creek at Markland Woods Country Club. The waterfall in the Etobicoke Creek near the south end of the creek. It is located beside the Toronto Golf Course. Four mute swans along the bank of the Etobicoke Creek. ^ a b "Etobicoke Creek". Geographical Names Data Base. Natural Resources Canada. Retrieved 2012-03-15. ^ E. A Cruikshank, ed. (1923). "From E. B. Littlehales to D. W. Smith". The Correspondence of Lieut. Governor John Graves Simcoe, 1789-1796. 3. Ontario Historical Society. p. 263. ^ Willoughby, Paul. "A Brief History of Etobicoke". Archived from the original on 2012-03-24. Retrieved 2012-03-15. ^ B Chamberlin (1891). Indians of North America. 1. p. 34. ^ E. A Cruikshank, ed. (1923). "Lieut. Governor Simcoe's Minutes for the Attention of the Executive Council". The Correspondence of Lieut. Governor John Graves Simcoe, 1789-1796. 4. Ontario Historical Society. p. 233. ^ E. A Cruikshank, ed. (1923). "From J. G. Simcoe to Lord Dorchester". The Correspondence of Lieut. Governor John Graves Simcoe, 1789-1796. 4. Ontario Historical Society. p. 239. ^ Graeme Mercer; et al. (1885). "Township of Etobicoke". History of Toronto and County of York, Ontario: Containing an Outline of the History of the Dominion of Canada; a History of the City of Toronto and the County of York, with the Townships, Towns, General and Local Statistics; Biographical Sketches, Volume 1. C.B. Robinson. ^ For example, in an atlas of York County of 1880, per "Map of York County". 1880 Map of Ontario Counties. The Canadian County Digital Atlas Project at McGill University. 2001. Retrieved 2012-03-15. ^ a b "Executive summary" (PDF). Etobicoke and Mimico Creeks Watersheds Technical Update Report. Toronto and Region Conservation Authority. 2010. ISBN 978-0-9811107-6-9. Retrieved 2012-03-15. ^ "Section 4.0 - Baseflow and water use" (PDF). Etobicoke and Mimico Creeks Watersheds Technical Update Report. Toronto and Region Conservation Authority. 2010. ISBN 978-0-9811107-6-9. Retrieved 2012-03-15. ^ McRae, Margaret (2011-10-09). "Etobicoke Creek". Parks and Gardens in Toronto West. Retrieved 2012-03-15. ^ "'A miracle' no deaths as Air France flight skids off runway, burns in Toronto". CBC News. 2005-08-02. Retrieved 2012-03-15. ^ "Air France crash 'a hell of a roller coaster'". ABC News. 2005-08-03. Retrieved 2012-03-15. "Topographic Map sheets 30M12 & 30M13". Atlas of Canada. Natural Resources Canada. 2006-02-06. Archived from the original on August 3, 2010. Retrieved 2009-02-14. Wikimedia Commons has media related to Etobicoke Creek.